PUR Active is one of the latest Vileda innovations. 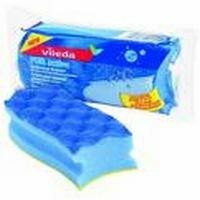 This special sponge scourer is designed to remove dirt effectively without scratching. It is safe to use even on delicate surfaces such as Teflon. This is due to a special structure which lifts the dirt as if you were using your fingernail, gently but effectively. One side is a scourer type surface and the other is more like a standard sponge, the cleaning action of either side is far superior to any standard sponge or scourer however, offering impressive cleaning ability whether used wet or dry.